The slope of the displacement-time graph gives the velocity and hence the velocity of the particle at time 2 s is tan30º = 1/√3. Similarly, the velocity of the particle at time 3 s is tan 60º = √3. Acceleration = change of velocity/time = [√3 – (1/√3)]/(3 – 2) = 2/√3. 9g/2 = 0 + (½) g t2 so that t = 3 s.
(3) A particle in one dimensional motion has initial velocity of 1 ms–1. The variation of its acceleration with time is represented by the semi circular curve shown in the adjoining figure. What is the velocity of the particle ( in ms–1) at the end of 8 seconds? 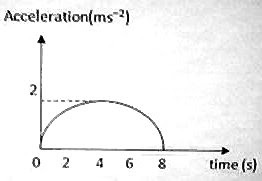 The area under the acceleration-time graph gives the change in velocity. [This area gives the sum of the products of the acceleration and time at all instants indicated by the curve. Since acceleration = change in velocity/time, the products of acceleration and time is the change in velocity and the area under the curve indeed gives the total change in the velocity]. Therefore, the change in velocity during 4 s = Area of the semicircle. 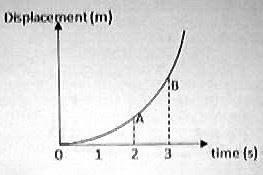 The displacement of the bob in 1 s is 2 m.
Therefore, the average velocity of the bob = Displacement/Time = 2 m/1 s = 2 ms–1. (5) A stone is projected vertically upwards from point A (fig.) at the foot of a tower. It passes the top level B of the tower after 2 s. After another 2 s it again reaches the top level of the tower while returning from the top point C of its path. What is the height of the tower? The time required for the upward journey of the stone is equal to the time required for the downward journey. Time required for the upward journey (from A to C) = 2 + (2/2) = 3 s.
You can imagine that a stone released from rest at the point C takes a time of 3 s for the fall from C to A so that distance CA = (½)gt2 = (½)×10×32 = 45 m.
Similarly, CB = (½)×10×12 = 5 m.
Therefore, height of the tower, BA = 45 – 5 = 40 m.
x = 3t2 + 2t + 4 where x is in metre and t is in second. If the particle could move for 3 seconds, what was its acceleration (in ms–2) at t = 2 s? Since this is independent of time t, the particle moves with uniform acceleration throughout the time interval. The correct option is 6 ms–2. t = α x2 + β x where α and β are positive constants. Since t has to be greater than 1 s, as indicated in the question (there is a last second for the fall! ), the answer is (2 + √2) s = 3.414 s.
You teach me baseball and I'll teach you relativity... No, we must not. You will learn about relativity faster than I learn baseball.